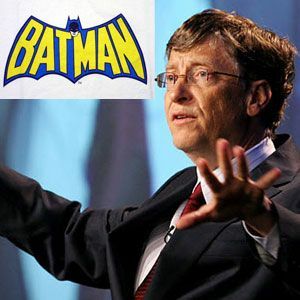 It’s the question that has been asked time and time again through the ages – is Bill Gates better than Batman? Or does the Caped Crusader come out on top every time? Well let’s examine some of the evidence. * Batman has a deep throaty grating voice (if you ignore the Adam West incarnation). This kind of voice makes Gotham’s enemies quake in fear. Bill Gates has a squeaky geeky voice. * Batman has the Batcave. Bill Gates has….the Microsoft Redmond headquarters? * Batman has a really cool black suit with matching menacing mask. Bill Gates wears expensive dress suits and sometimes a snazzy sweater. Bruce Wayne has Wayne Enterprises making secret weapons in its basement, guarded over by Morgan Freeman. Bill Gates had Microsoft making Windows Vista and the .NET framework. Enough said there. But one thing they BOTH have in common is that they are both stinking rich – and Bill Gates and his wife Melinda can’t give it away fast enough, through their charitable foundation. So while we jest about his suits, Steve Ballmer and Windows Vista, it can be argued that Gates is redefining the meaning of the word “heroism”. Instead of fighting bad guys with a “KAPOW!”, perhaps being a hero is giving what you can afford to charities and making a difference in someone’s life? What do you think? IS Bill Gates better than Batman? Wow, Bill have always been my idol, but I never thought he's someone like this. Better than those money-sucking politicians. Bill, you're awesome. But I still prefer PS3 over XBOX360. No hard feelings, kay? I use PurpleHaze by Jimmy Hendrix. Are lives more important or is a stupid operating system more important. He has people who are buying from him, and he is earning money, giving away in charities, so whats the harm? So indirectly, people are donating to charities by buying Windows. percent!" He is basically saying that vaccines, healthcare, and reproductive health services are eugenics programs that are being used to carry out genocide across the earth. Bill Gates recently purchased a few hundred million dollars in Monsanto stocks. Monsanto GMO crops are proven to cause sterility by the third generation in all animals that consume GMO crops. Bill Gates is also funding research to develop mosquito's that are being released into the environments that injects a "vaccine" that will alter brain chemistry. Forced mass medication of a population is highly illegal and straight out of a concentration camp playbook. Hitler, he wrote her fan letters and sent his top ss officers to her conferences to learn about racial purity. Do some real research before you put people on a pedestal who meet in secret and discuss how to covertly carry out genocide against humanity. These people are monsters. i don't believe that. you are just hating on him. I would seriously love to see your sources. And no, a webpage written by a conspiracy theorist wearing a tinfoil hat won't do! i don't agree with this things. OMG Bill, the kiddies are quoting the internet again. You think Bill has the monopoly on urm attempting a monopoly? I've got news for you. It's just as common as your passed down opinion. Wow, so much hate for Bill Gates! What can he do to redeem himself in your eyes? Nothing apparently. All you Microsoft bashers are obviously running Mac OS or Linux right? Right? If I am not mistaken Mark is a Windows user. "Is Bill Gates Better Than Batman?" Better At Giving Head? Better At Taking The Salami?? YES. I don't see any mention of his giving $335K to evil ALEC. Every agency in the world that regulates M$FT has his face on a Wanted Poster. Bill Gates is a Thief ... An Incompetent Thief. Well that Steve Jobs who stole and stole again to perfect his iThings and pledged to destroy anyone who would copy features from his products died wealthy..from cancer. Well, as much as I don't like the high price of Windows in my currency I'd vote for Bill Gates if he would run for any presidency.